Today I replaced the distributor cap and rotor. The points were incorrect, so I used the old points. And the condensor did not arrive. In short, a long way from a tune up. The timing was bouncing all over the place, despite the distributor being snug. I did not replace the plug wires, so they are two tone - extremely faded blue jeans blue and process blue blue. 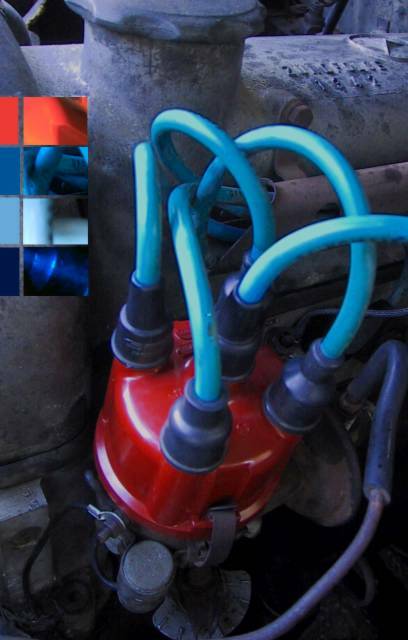 The distributor cap is a color only an auto parts manufacturer could love. And, of course, the fading black of the wire boots. Altogether, the colors are so complimentary that I changed the contrasting blue coil wire connector to a non-insulated crimp connector (as seen in the lower left). I like the colors so much, I am thinking everything should be these colors, especially the exciting racing livery for the upcoming Mister Jalopy Inaugural Hoopty Invitational Outlaw Cup. Replacing the insulated connector with a non-insulated connector could be disasterous on race day. I can not see anywhere that the wire could short out, but physics change at high race speeds. Along with everything else that is on the line, now we realize we are racing for aesthetics.